Whether you are looking for electronics, clothes, shoes, spices, handicraft items or pots, in Delhi you can find them all on the street. While shopping at a mall is comfortable and you get high-quality products, the best experience of shopping in Delhi is at its street markets or bazaars. From bargaining for a good price to the wonderful street food options available, the roadside shopping experience is a treat. For best results, follow our guide to the top 12 places for street shopping in Delhi. An initiative by the Delhi government, Delhi Haat is a shopping market for traditional clothing and handicraft items. Designed to look like a traditional village market, the stores here are set up by rural artisans who come to sell their handmade ware. Besides shopping, there are a few cultural programs held at Delhi Haat. A must visit for any tourist to the country’s capital. This market is one of the most popular shopping destinations in India. At the Janpath market you will find a lot of products ranging from Tibetan good to typical Gujarati sarees, a variety of cloth, shoes, junk jewellery, and much more. The market is a huge hit with out-of-towners, shopping enthusiasts and the young Delhi crowd. Paharganj is noted for its cafes and bars. However, there is a market here where you will find a variety of jewellery items. 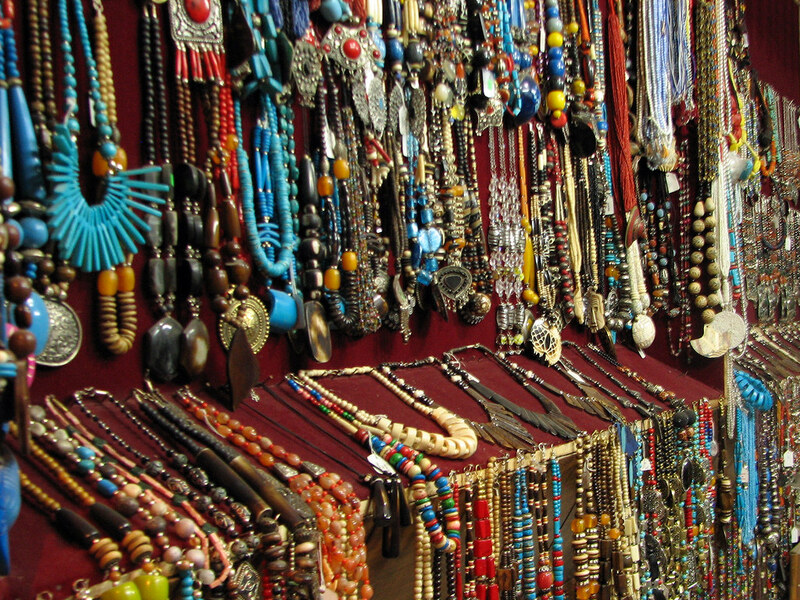 Necklaces, bracelets, junk jewellery or pendants, you will find it all at this market. There is a small section at the Paharganj market where you will find kids’ clothing and a few shops selling hippie clothes and incense. It is the best place for jewellery shopping in Delhi. Visit the Gaffar market for great deals on electronics. If you are on the hunt for new electronics or are looking for electronic accessories, head over to the Gaffar market in Karol Bagh. Also called ‘Grey Market’, here you will the best deals on gadgets, especially mobiles. At the Gaffar Market, you can get yourself a second hand mobile for a price as low as Rs. 8,000. Some big stores at this market have with them imported electronic items that have not been released in the Indian market. A great place for street shopping in Delhi. Palika Bazaar is an underground air-conditioned bazaar in Connaught Place. This huge market has shops that sells electronic gadgets and mobiles at very good prices. The market specialises in gaming consoles and video games. Delhi’s gamers always converge at the market to get the latest Playstation and Xbox games. A mix of branded stores and street stalls makeup the market at Karol Bagh. These shops sell a variety of products ranging from jewellery to clothes, spices, electronics and much more. There are a few restaurants too art Karol Bagh that are popular with shoppers, who often drop by for a light snack after they’ve done shopping. 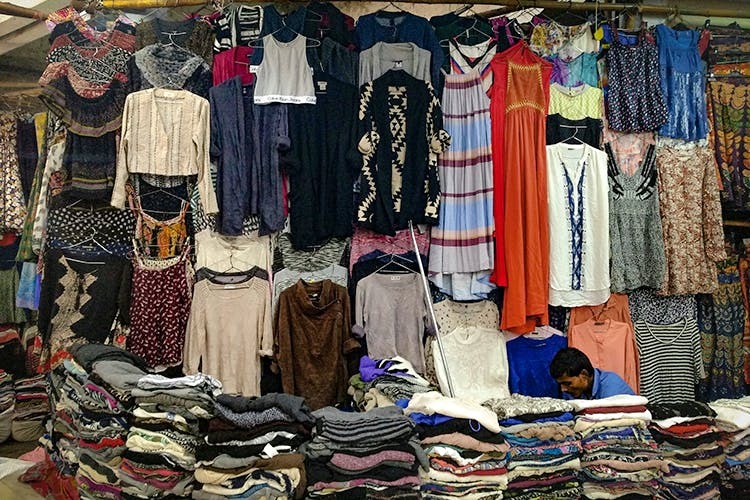 The Sarojini Market in Delhi is every woman’s dream place for shopping. At this famous street market, you can find first copies of branded clothing for half the price. Whether you are looking for a Zara top or Pepe jeans, you will find it at prices less than Rs. 1,000. In the market, there are a few shops selling junk jewellery and shoes as well. While you are here, do not forget to check out the famous momo stall at the Sarojini Nagar market. The Lajpat Rai market is a wholesale market that is frequented by many small electronics retailers who come to buy gadgets in bulk. However, there is a catch, you have got to be smart and crack a good deal with the suppliers. The products sold here are a mixture of imitation and original. The market is run by Tibetans and here you will find a variety of Tibetan products, including clothes. Just before the winter months, at this market you will also find woollies and winter clothing. This street market is frequented by students and tourists looking to buy clothes and accessories at reasonably low prices. Don’t forget to check out the small shops in the market that sell knick-knacks and junk jewellery. 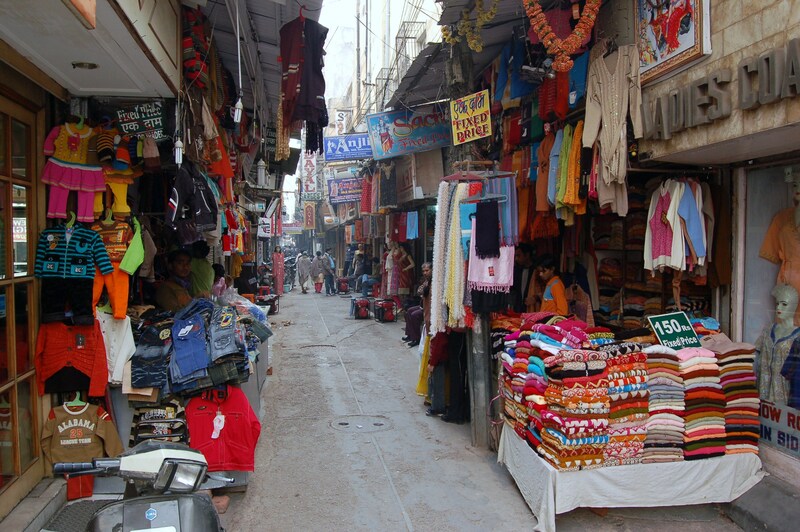 This market has some of the most popular stores in Delhi. 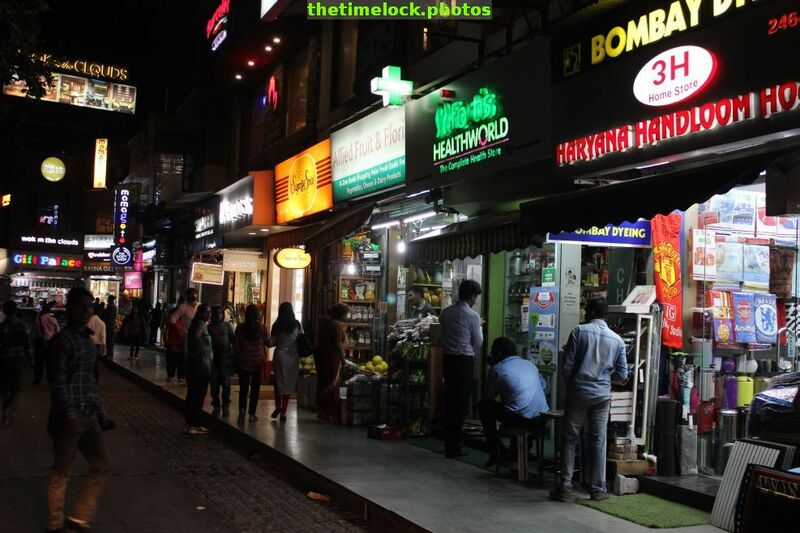 Good Earth, Amrapali Jewellers and Sham Di Haat are some of the famous stores located in Khan market. Apart from shopping, the Khan market is also known for its street food options. Don’t forget to check out the underground bookstore in Khan market. Popular with students, the Majnu ka Tilla is a famous Tibetan market that sells women’s clothing. Palazzo pants, tops, ethnic Indian wear and denims. During the winter, you’ll find a woolen clothes and boots being sold here. There are few street food stalls situated close to the market. If you are looking for the latest fashion pieces at throwaway prices then there is no better place to shop than at Kamla Nagar. The shopping market here is flooded with stores selling the latest, trendy fashion pieces at cheap rates. If you are lucky, you might get yourself a trendy top for as little as Rs.150 apiece. The market is popular with Delhi’s North Campus students. The Sadar Bazaar is where you should go to buy decorative items for the house. Whether you are looking for curtains, small furniture or decorative pieces for your house, you will find it all at the Sadar Bazaar. The best time to visit the market is during the festival period. At Diwali or Christmas, the market is flooded with extremely gorgeous home decor items. Delhi has probably the best street shopping scene in India. At the many street shopping centres in Delhi, one can find a variety of products at great prices. We hope that our list of the 13 best street shopping places in Delhi helps you get just what you are looking for. If you need any more suggestions or tips on how to shop at street market, we would be glad to help. All you need to do is send us your questions in the comments below and we will get back to you. 16 of the Cafes in Delhi For the Lovely Couples!